Remove the thick green leaves from your cauliflower and cut into tiny florets. I usually make my florets or slices 1-inch long and 1/4-inch thick. 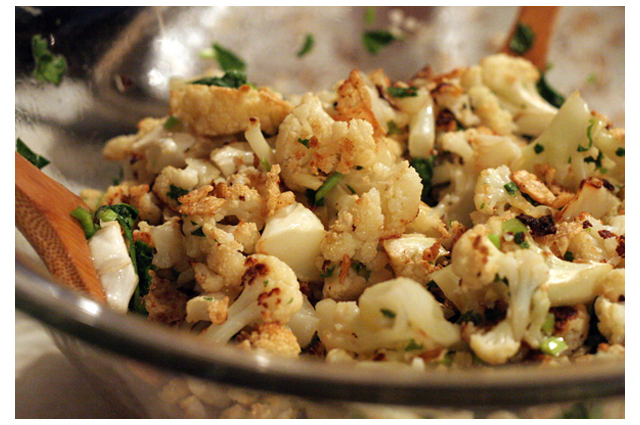 Place cauliflower in a baking or casserole dish. Sprinkle with cumin and shake or stir to coat the cauliflower. 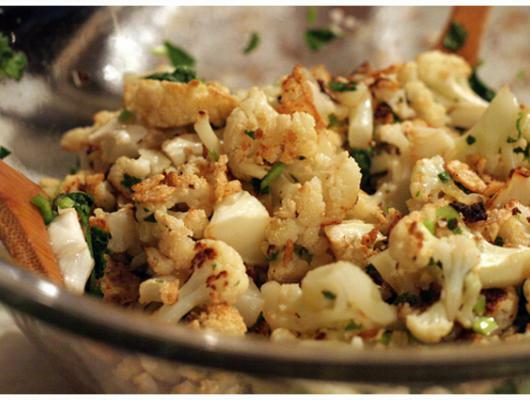 Drizzle with olive oil, season with salt and bake for 25-30 minutes or until the cauliflower is tender and edges are beginning to turn golden brown. I tend to "overcook" mine until the cauliflower is super crispy, but it is completely up to you! Serve warm with a sprinkle of freshly minced chives. This looks so VERY good....going to try it this week. Thanks for posting! Used to make a similar thing on a huge grill plate at a soupkitchen-esque night with the addition of chickpeas, garlic, chilli, sesame, soy, paprika, turmeric, cardamon, etc etc etc get creative! I could eat buckets of it, damn trying to be healthy though, I go and start worrying about if there is too much carbonification crispy black bits in it? Mmm, this looks yummy...must try it! Cauliflower always gets such a bad rap as a bland, boring white food -- and honestly, if you served it simply boiled or steamed, this isn't far from the truth. The key to cooking with cauliflower is knowing which flavors to pair with it! Cumin and cauliflower were simply made for each other! Cumin has a warm aroma and nutty, almost peppery flavor, which pairs well with cauliflower's naturally nutty and vegetal flavor -- a flavor similar to very mild broccoli. Roasting is my preferred method for cooking cauliflower -- the florets are cooked until tender while the edges turn a golden brown and become quite crisp! Cauliflower, for being a white food, is also surprisingly high in nutritional value! Packed with dietary fiber, low in carbohydrates and a good source of folate (folic acid/vitamin B9) and vitamin C.